This was good back in the day. It's impossible to believe this garbage software is still being developed. I am, to be frank, stunned. An excellent newsreader. I've tried all sorts, and they all seem to have glitches or use huge amounts of ram. This one just gets on with it. Has tons of features that someone must use but I don't. The Google Reader integration seems clever, basically using Google in the background to do all the fetching etc. It always seemed to me that readers that work directly become very processor intensive whenever they're downloading. Some people moan about the adware aspect of this reader, but it's just a square area in the corner that displays an ad that changes very rarely. Not the slightest bit distracting. This use to be a great program. I paid for it back in the days, then they went freeware, and now payware again...... really ? 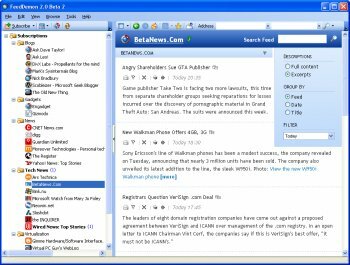 FeedDemon was once, in my opinion, the "leader of the pack" for desktop RSS reader solutions. Like many here, I even coughed up 30 clams to register it when it (first) went Ad/Shareware. It's clear, however, that development has essentially stalled on this once excellent app, and the fact that it has swung back to Freeware then back again to Ad/Shareware is offensive and dishonest. These days, I prefer using Feedly.com (a Firefox, Chrome and, now, Safari extension) for my RSS reading, and I love it. PS - Bags and bags of FAIL for @dhry: "11-point" word =/= "11-letter" word. If this clown spent more time playing real games with real people, and less time getting into childish fights on the internet, he might just be able to comprehend the difference. Ok after a few days of using version 3, I had considered paying the $10 to get rid of the ads. So...back to 2.7, and they don't get my $10. Decided to try the latest release. Was surprised to see that they added an option to buy a serial number to remove the ads!!!!! However then I found out that all of us who spent $30 to buy FeedDemon in the past (before it was freeware) now get the shaft and have to spend another $10. Ironically, Greatnews (despite its annoyingly stalled development) still seems to get marginally better and better by comparison with Feeddemon each time a new FD is released. Final nail in TomasF's argument: play an 11-letter word against anyone with even moderate Scrabble skill and you'll get dominated before you've even had time to start chuckling. I'll keep checking back on this program since for some reason I still have faith they'll get the adware out of it and earn another rating star in the process. A bit more faith than the faith I have that TomasF will get some sort of clue before this decade is out.. I absolutely agree with dhry. After all, who in this day and age would use *more than one* computer!? And it's completely laughable to think that someone who follows enough feeds to use a dedicated reader would want to keep up to date on feeds on say, a work computer, home computer, and maybe a netbook on the road and still enjoy the benefits of a desktop app. I saw a couple of puffs for GreatNews so I took a look at its capabilities. The obvious thing missing is synchronisation. 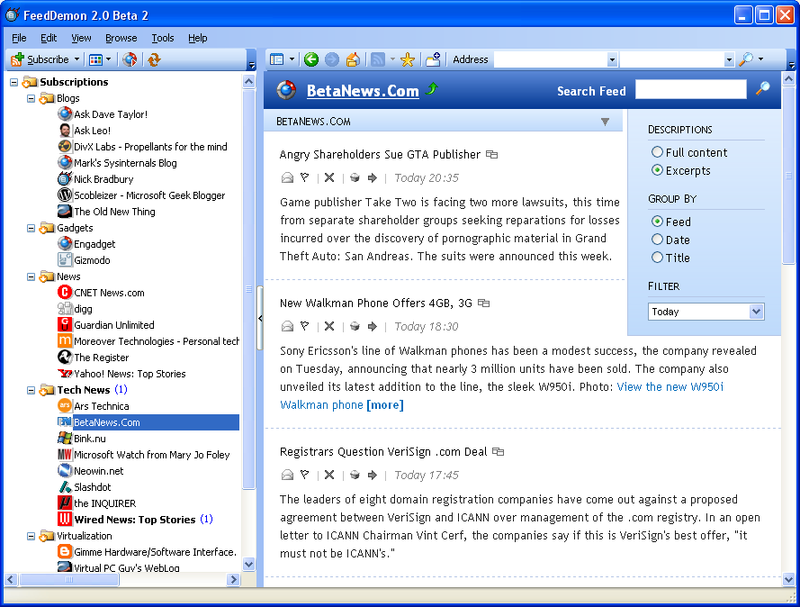 FeedDemon can synchronise your feeds, originally with NewsGator, now with Google Reader. That alone makes it the best Windows feed reader. If adware is praised with five star reviews, rest assured, it will flourish. Ultimately it is the user that determines the success of adware. There is no program that is so good an acceptable alternative cannot be found. (In this case, GreatNews). If adware is not used it will cease to exist.